Someone mailed out information to a club I'm in as an .XLS file. Another Excel spreadsheet. Sigh. I do know one way to read them. Fire up OpenOffice, listen to my CPU fan spin as I wait forever for the app to start up, open the xls file, then click in one cell after another as I deal with the fact that spreadsheet programs only show you a tiny part of the text in each cell. I'm not against spreadsheets per se -- they're great for calculating tables of interconnected numbers -- but they're a terrible way to read tabular data. Over the years, lots of open-source programs like word2x and catdoc have sprung up to read the text in MS Word .doc files. Surely by now there must be something like that for XLS files? Well, I didn't find any ready-made programs, but I found something better: Python's xlrd module, as well as a nice clear example at ScienceOSS of how to Read Excel files from Python. Of course, having gotten that far, I wanted better formatting so I could compare the values in the spreadsheet. Didn't take long to write, and the whole thing still came out under 40 lines: xlsrd. And I was able to read that XLS file that was mailed to the club, easily and without hassle. I'm forever amazed at all the wonderful, easy-to-use modules there are for Python. How do you delete email from a mail server without downloading or reading it all? Why? Maybe you got a huge load of spam and you need to delete it. Maybe you have your laptop set up to keep a copy of your mail on the server so you can get it on your desktop later ... but after a while you realize it's not worth downloading all that mail again. In my case, I use an ISP that keeps copies of all mail forwarded from one alias to another, so I periodically need to clean out the copies. There are quite a few reasons you might want to delete mail without reading it ... so I was surprised to find that there didn't seem to be any easy way to do so. But POP3 is a fairly simple protocol. How hard could it be to write a Python script to do what I needed? Not hard at all, in fact. The poplib package does most of the work for you, encapsulating both the networking and the POP3 protocol. It even does SSL, so you don't have to send your password in the clear. Once you've authenticated, you can list() messages, which gives you a status and a list of message numbers and sizes, separated by a space. Just loop through them and delete each one. Of course, you might want to add more error checking, loop through a list of users, etc. Here's the full script: deletemail. 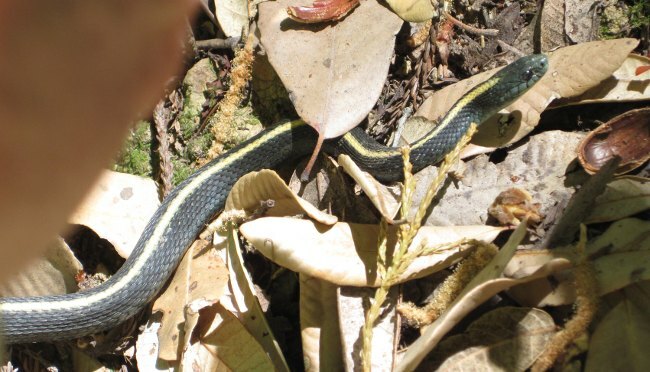 A recent short hike at Sanborn was unexpectedly productive for creepy-crawlies. At the lower pond, we looked for California newts. There were lots of newts last week a few miles away at Montebello, so we thought we'd see some at Sanborn too. But there weren't many adult newts in the pond -- we could only find three. That pond has never recovered from its draining three years ago, which seems to have killed all the fish and crayfish and driven away most of the newts. 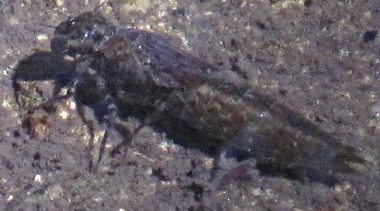 But we did see one very interesting sight: a large underwater bug, at least 2 inches long. It first caught our attention jetting through the water to the shallows near where we stood, where it sank to the bottom and rested for a while (posing for pictures!) It moved only slightly during the couple of minutes we watched it ... then it suddenly jetted off toward another part of the pond. I say "jetted" because it didn't move its legs or proto-wings at all; it moved like a torpedo, presumably propelled by a jet of water. Upon returning home, at tip from a friend (thanks, Wolf!) I looked up dragonfly nymphs. Indeed, that's what this was. Much more massive than an adult dragonfly, these larvae apparently live underwater for several years, eating bugs, fish and small amphibians, until they're finally ready to metamorphose into the beautiful winged adults we're familiar with. An interesting creature, and one I'd never seen before. The small upper pond, unlike the lower one, was full of life. Small fish up to about an inch and a half schooled in the shallows. Some larger koi lurked near the reeds. 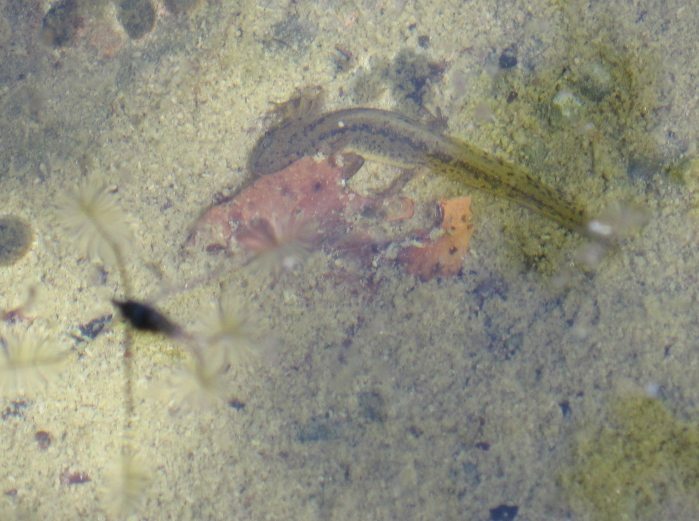 But I spotted something that clearly wasn't a fish: yes, there's still at least one larval newt left in the pond. It obligingly lounged in a sunny spot near the pond's edge so I could snap pictures capturing its feathery gills as well as four tiny feet. We also stopped by the scum pond at Walden West. No bullfrogs, no turtles. The only life we saw there was a couple of female mallards, eagerly vacuuming up the scum. That pond, with its surface completely covered with algae, must be paradise for an algae-eating duck ... I wonder why I don't see more of them there. 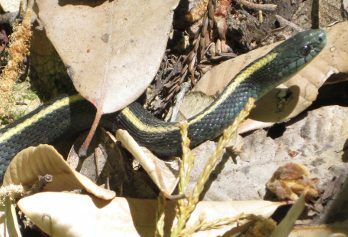 And as long as the subject is crawling animals, I can't resist throwing in a snapshot of a garter snake I spotted today at Huddart. Nothing especially rare or exotic, but a pretty little thing nontheless. The Beginning Python class has pretty much died down -- although there are still a couple of interested students posting really great homework solutions, I think most people have fallen behind, and it's time to wrap up the course. So today, I didn't post a formal lesson. But I did have something to share about how I used Python's object-oriented capabilities to solve a problem I had copying new podcast files onto my MP3 player. I used Python's built-in list sort() function, along with the easy way it lets me define operators like < and > for any object I define. You can read all about it in my post to the Courses list describing how I sorted my list of podcast objects. Or just go straight to the final program, pods. This past spring I planted an apple tree. I expected it would be simple, even though I had a couple of goals I wanted to meet. I prefer tart green apples -- no mealy too-sweet red delicious types ... or worse, golden delicious. And I was hoping to get something that matured any time other than mid-October -- because that's when the guava trees go crazy and we're inundated with fruit. So, go to the nursery, find a green apple tree that matures at some other time, buy it and plant it. Right? Turns out apples are complicated. Some apple varieties are triploid, which has to do with how many chromosomes need to group together to produce fruit. Diploid apple trees can produce fruit all by themselves ("self pollinating"), while triploid varieties need another apple tree nearby -- one that flowers at about the same time -- to pollinate them. In addition, apparently you can't just take a seed out of an apple you ate and plant it. Well, you can, but it won't grow as well. Modern apple trees take branches from varieties that make good fruit, and graft them to rootstock from different, presumably hardier, varieties. But as long as they're grafting anyway, that means it's just as easy to make a tree that has branches of several different types. Cool! And with any luck, they'll be types that can either pollinate each other, if they don't self-pollinate. After failing to locate any pippins or other non-granny green apples, I ended up with a little tree with four branches: fuji, gala, granny smith (we'll just have to compete with the guavas) and ... golden delicious. Yes, it turns out that you can't buy a multi-variety apple tree that doesn't include golden delicious. My least favorite apple. I have no idea why they all include it. Maybe it's an exceptionally good pollinator for the varieties that actually taste good. But a month or so after planting, the tree was a foot taller and covered with flowers. And a few weeks after that, there were three tiny apples growing: a fuji, a granny and a golden. How exciting! Exciting for a few weeks -- until two of the three little grape-sized apples-to-be vanished. I still don't know if some bird mistook them for a berry, or a mischievous squirrel wanted something to bury. All I was left with was -- doesn't it just figure! - the golden delicious, steadily growing on its branch. But wait. Apples all start out green, right? This one certainly was. What if I picked it before it turned yellow? Would that give me that early-maturing green apple I'd been hoping for? Maybe golden delicious wasn't so bad after all. I eagerly watched over the next month or two as my single apple grew and matured. And last week, it finally started to change from a deep pippin-like hue to a more yellowish green. So I picked it. And ate it for breakfast. It was excellent: tart and firm. I hereby announce the invention of the "green delicious" apple variety. I definitely recommend it. I'm looking forward to next year's crop ... which I hope will be a bit larger than this year's. Lesson 9 in my online Python course is up: Lesson 9: Extras (requested topics), including string operations, web development and GUI toolkits. The web development and GUI toolkits are topics which were requested by students, while the string ops are things that just seemed too useful not to include. A while ago I switched ISPs, and maintaining a lot of email addresses got more complicated. So I decided to consolidate. But changing your email address turns out to be tricky on some sites. For example, on Amazon it apparently requires a phone call to customer support (I haven't gotten around to it yet, but that's what their email support people told me to do). Then there's Yahoo groups. I'm in quite a few groups, so when I made the switch, I went to groups.yahoo.com, added a valid address and made it my primary address. Great -- thought I was done. The email address you are using for this group is currently bouncing. More info here. Gosh, that's some helpful info, Yahoo! So how do you really change it? There are lots of ways to get to the Yahoo Groups "Manage your email addresses" page -- but it shows only the new address, listed as primary, as primary, and doesn't show the old address where it's actually trying to send all the mail. No way to delete it from there. Now, you can Edit membership in any particular group: that shows both the old nonworking address (with the box checked) and the new one (check the box to change it). Great -- so I'm supposed to do that for all 25 or so groups I'm in? Seriously? After much searching, I finally found an old discussion thread with a link to the Edit my groups page. Scroll down to the bottom and look for "Set all of the above to". It's still not a one-step operation -- my groups are spread across three pages and there's no "View all on one page", and each time you submit a page, it takes you back to "View groups" mode so you have to click on the next page, then click on "Edit groups" again. Still, it's a heck of a lot faster than going through all the groups one by one. In theory it's all changed now. But then, I thought that last time ... time will tell whether the mail actually starts flowing again. Meanwhile, Yahoo developers: you might want to take a look at that "More info" page that just gives a permission error. Lesson 8 in my online Python course is up: Lesson 8: Extras, including exception handling, optional arguments, and running system commands. A motley collection of fun and useful topics that didn't quite fit anywhere in the earlier formal lessons, but you'll find a lot of use for them in writing real-world Python scripts. In the homework, I have some examples of some of my scripts using these techniques; I'm sure the students will have lots of interesting problems of their own. We went exploring around the upper Skyline-to-the-Sea trail yesterday. The mysterious chlorine smell was very evident, for the first time this year. Usually I've first noticed it in early July or even June, but although we had some very hot weather in early June this year, it wasn't enough to bring out the smell. I've made no progress in identifying it, but I continue to suspect tanoaks as the chlorine culprit. It was a good day for reptiles, too. We surprised the biggest ring-necked snake I've ever seen -- well over two feet long and thicker than my thumb (which admittedly isn't saying much). It hastened off the trail before I could get the camera out. Then back at home, I found a small young alligator lizard splayed out in the shade on the sidewalk of our back yard. We've occasionally had alligator lizards here before, but never such a small one. Again, no picture; instead we just watched as it made its way across the yard to hide under the rosemary. I hope it stays around.